liquid laundry packet exposures in children. It all started in the laundry room. I tried to open the door from the garage to the laundry room and it wouldn’t budge. I push and pulled it back. I pushed a little more and then I pulled the door close to me. I laid on the floor, and I tried to push whatever was in the way out of the way. It is okay to giggle as you picture me in a dress on the floor trying to push laundry out of the way just so I could open the door. I just couldn’t understand why I couldn’t get the door open. The dog was crying and licking my hand. I decided this isn’t going to work and I needed to use the front door. I walked around to the front door. I twisted the handle only to realize it was locked. I began to frantically ring the bell as if the dog could open the door. She tried to climb up by the knob and started to scratch and howl. The kids were at school, so this door would remain locked. I had finally lost my marbles. I went back to my car and grabbed my keys. I opened the front door. I walked down the hall to the door that wouldn’t budge. I looked inside the laundry room, and this is what I saw in the laundry room. 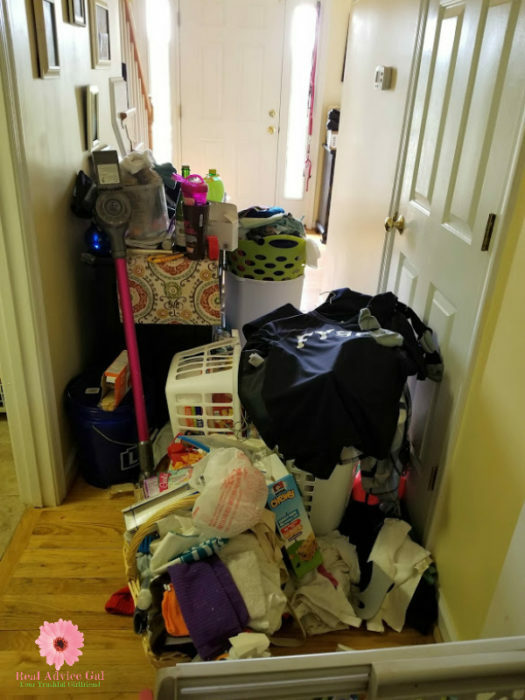 I was so mad I moved it all into the hall. I mean who lives like this? The answer was we did. 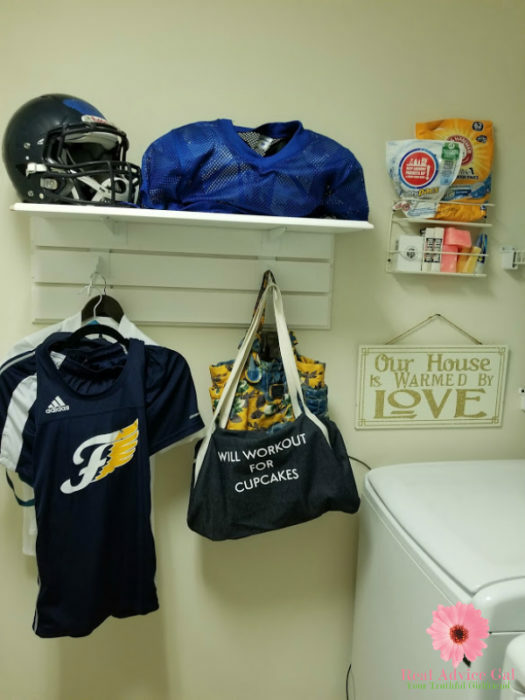 The laundry room is the hub of our house. The place where everything needs to get done. I had to figure out a way to clean it up, keep it clean, and make it work for me. I also had to make it fun or it wasn’t going to happen. 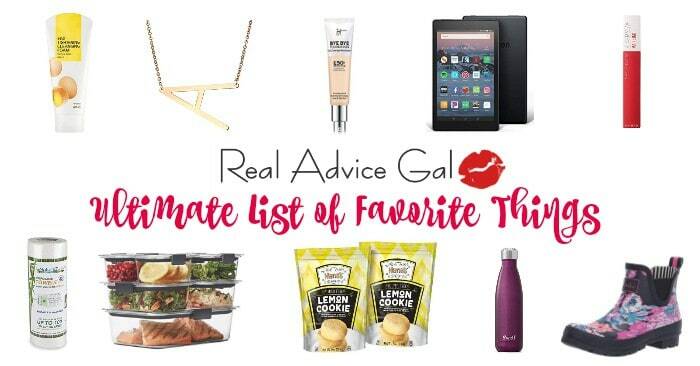 These are my 5 Time-Saving Tips That Will Make Laundry Fun. a.) My kids hate to help one another with their laundry. This leads to fighting that I then have to deal with. b.) They can’t find their uniforms ever. c.) We had absolutely no space to fold the laundry or put away the laundry. d.) I couldn’t find everything I needed to do the laundry quickly. 2. 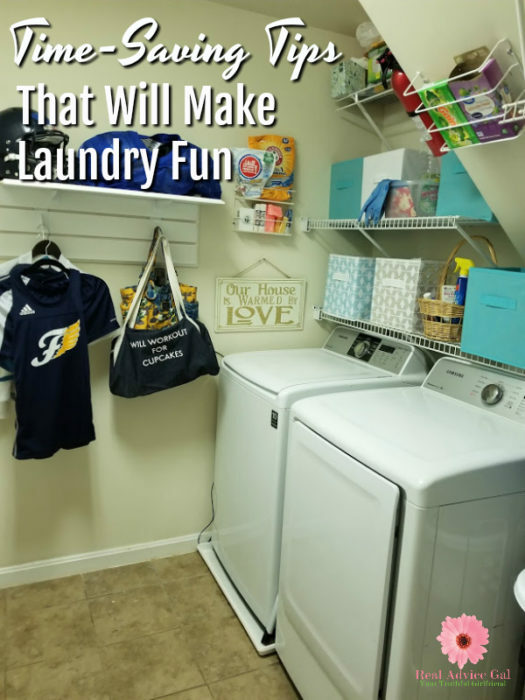 Make your laundry room a place you want to be in. I added a couple of pictures and I got really cheap under $4 storage containers to sort my supplies and add some color to the room. 3. Think of a system. I found a cheap shelving unit that was wide enough and had enough space between the shelves to hold my laundry baskets. It was under $25, and now I can see my floor. I also had a place for each child to have their own basket. 4. 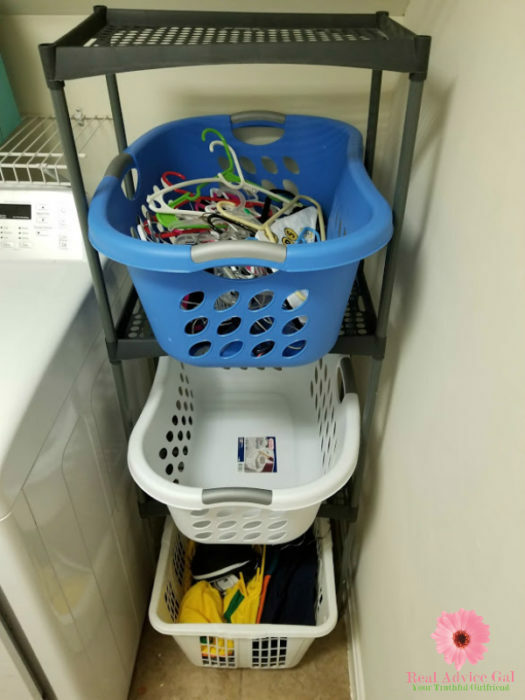 Put your laundry supplies in easily accessible spaces. When you do this remember to think about the importance of safety. I love those liquid laundry packets but, I also want to make sure to prevent accidents so I put them in a place that my children can’t reach. a.) As with any household cleaning product, laundry packets must be stored in their original container or pouch and kept out of sight and reach of children. b.) Make sure to lock detergent packets up high and out of reach. This is an effective way to keep these products out of reach of young children, especially when little ones begin exploring closets and cabinets at an early age. Visit packetsup.com to learn more information and tools to help prevent exposures from liquid laundry packets. 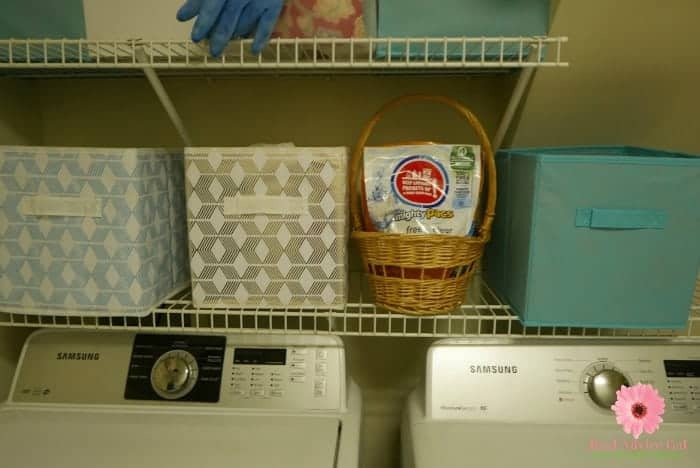 The American Cleaning Institute (ACI) created PACKETS UP!, an educational initiative for parents and caregivers, to help them learn about the importance of proper use and storage of liquid laundry packets. Even if they stored up high, make sure they stay securely closed. This video will help you to see how a toddler sees the world Through Their Eyes. 5. Develop a system to do your laundry and put on some music while implementing it. I have been known to watch trash TV while doing laundry. I now fold the laundry put it in their bucket, or I hang it. Then I put it in each kid’s basket. When they get home from school, they take the baskets and put away their clothes. They bring down their dirty laundry, and I wait a couple of days, and then I wash their loads. I decided I am only doing laundry twice a week unless they need uniforms. I leave their uniforms in the laundry room because I am tired of getting gray hair when they can’t find their uniforms. I bet you are saying what about all this makes laundry fun. The answer is I am only doing it twice a week so now I can have more fun. I can open my laundry room door without reverting to a belly crawl. I also do not have to spend any time trying to find uniforms or listening to kids complain about handling laundry that isn’t theirs. And, as an added benefit, we now have fewer missing socks! Just another reminder because safety and prevention are so important. If you have little children, remember to store the liquid laundry packets in their original container or pouch and keep them out of sight and reach. You can also use the containers like my blue, white, and design ones to place the sealed packet package in them. They aren’t as tempting if the child can’t see them. 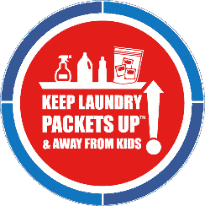 Go to packetsup.com for more information and enter your details to receive a free reminder cling – parents should place it in a visible location to serve as a daily reminder to store laundry packets up and away from children. I put mine on my washer as a reminder. Follow #PacketsUp on Facebook and Twitter to keep up to speed on the latest in laundry room safety habits.